This 4 Port (3 External/1 Internal) StarTech PCI1394MP PCI FireWire Adapter Card lets you connect iPods, portable drives, MP3 players, digital camcorders and more to your computer. The StarTech PCI1394MP PCI FireWire Adapter Card supports hot-swapping, so you�ll be able to plug, unplug, and swap your FireWire peripherals with ease. 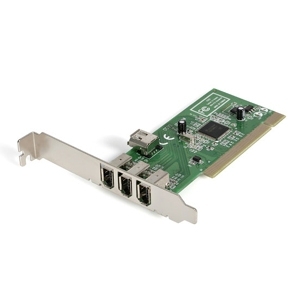 Guaranteed to work with both PCs and Macs, the StarTech PCI1394MP PCI FireWire Adapter Card provides both standard and low profile brackets for adapting to slimline or small form factor system applications.